President Obama took on the issue of race and policing in a town hall moderated by ABC News' David Muir, facing down critics on his support for police and trying to bridge the divide between a law enforcement community reeling from the deaths of five officers in Dallas and those impacted by recent police-involved shooting deaths of two black men. Add Race Relations as an interest to stay up to date on the latest Race Relations news, video, and analysis from ABC News. The president, who has addressed the nation about both issues, called for local police departments and communities across the country to work together as the nation sits on edge and urged that it's not "us versus them." He also tackled concerns of some about the "Black Lives Matter Movement," saying it's not anti-police and that no one wants to avoid police shootings more than cops themselves. "It shatters them too," the president said. "I don’t want a generation of young people to grow up thinking either that they have to mistrust the police or alternatively, that the police who are doing a good job and out there, taking care of their communities that they’re constantly at risk not just from criminals but also because of the community mistrusts them." "I’ll be honest with you," Obama continued. "It’s going to require all of us not to close ourselves off and go to corners but rather require us to come together and listen to each other." Obama spoke as part of a Disney Media Networks town hall titled "The President and the People: A National Conversation," which aired Thursday at 8 p.m. ET and was simulcast commercial-free on ABC, ESPN, Freeform, ABCNews.com, Freeform Digital, Watch ABC, Watch ESPN, Yahoo, ABC News’ Facebook page and YouTube channel as well as ABC Radio and ESPN Radio. Disney is the parent company of ABC News. During the event in Washington, D.C., which also featured ESPN's Jemele Hill, the president spoke with a diverse group of Americans from across the country. Relatives of police shooting victims, parents, police officers and "Black Lives Matter" activists, discussed the issues of race, justice and the role of the police with the commander-in-chief. Milwaukee Police Chief Edward Flynn asks President Obama a question during the ABC News Town Hall with David Muir, July 14, 2016, in Washington. The event came just days after Obama attended a memorial for five Dallas police officers shot dead last week by a sniper during a protest for the police-involved shooting deaths of two black man, Alton Sterling in Louisiana and Philando Castile in Minnesota. A renewed rallying cry for nationwide protests erupted after videos emerged showing Sterling being shot and the aftermath of Castile's death. Diamond Reynolds, Castile's girlfriend, who livestreamed the aftermath of her boyfriend's death, participated in the town hall via satellite to ask the president how the country can come together in the wake of these tragedies. Obama encouraged police officers to "walk the beat" and get to know the residents they are sworn to protect in order to reduce fear, although he acknowledged that many police officers feel like they are under fire. "I think that the place to start is for everybody to recognize that we need police officers," Obama said. "And we need those police officers to be embraced by the community. "If there are good relations between the police and those communities, then the communities are going to be safer and police officers will be safer. It’s good for everybody." One of the most touching moments from the town hall was when Toya Graham, the mom who became a viral sensation after she was seen on camera disciplining her son during the April 2015 Freddie Gray protests, asked the president what could she do, as a single mother with six children, to keep them all safe. Country singer Coffey Anderson, who made a viral video about a lesson he said he learned from his father on interacting with police, asked the president if he had ever been pulled over. 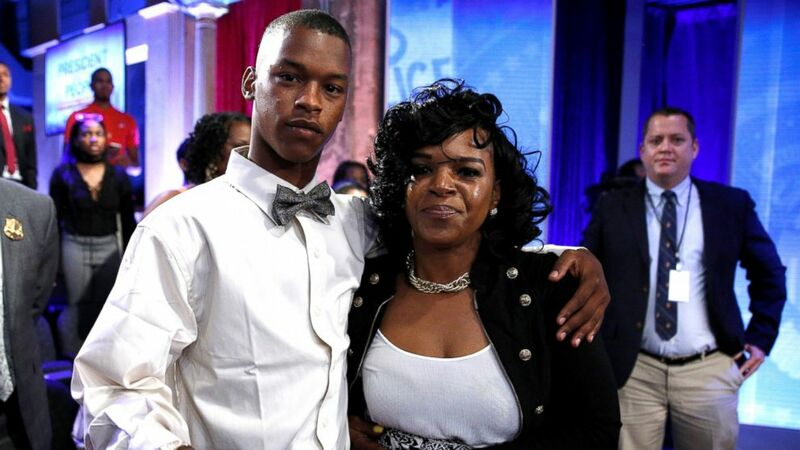 Baltimore mother Toya Graham who famously waded into a riot to retrieve her son Michael Singleton (L) stands with him after they joined U.S. President Barack Obama in a televised town hall in Washington, D.C., July 14, 2016. The president, who was raised by a single mother, said he too had experienced racial prejudice over the years. He shared a story about a white woman refusing to ride an elevator with him when he was growing up in Hawaii, and recounted his experiences with getting pulled over by police for speeding. "Over time you start learning as you’re crossing the street suddenly the locks start going on doors," Obama continued. "And I do think that in that sense what is true for me is true for a lot of African-American men is there’s a greater presumption of dangerousness that arises from the social and cultural perceptions that have been fed to folks for a long time." "I think it is not as bad as it used to be, but it’s still there and there’s a history to that," he continued. "Some of it involves us being very conscious of our assumptions because white folks and Latino folks also carry some assumptions. You may see a police officer who’s doing everything right and you automatically assume the worst rather than the best in him. And we have to guard against that as well." Alton Sterling's 15-year-old son, Cameron, who was seen openly sobbing during a press conference about his father's death last week, asked the president how he can unite people. "I don’t know anybody who wants to see the kinds of deaths that we’ve seen over the past week," Obama said. "In communities all across the country, there is real concern about making sure that interactions between police and community don’t result in death, and nobody wishes that more than police officers themselves, because when you talk to those police officers who have, whether justified or not, whatever the findings have ended up killing somebody. It shatters them too." In another powerful moment, Jermar Taylor, the 12-year-old son of a woman shielded by police as she tried to protect her kids during a sniper attack in Dallas, told the president that he now wants to become a police officer so he can "tell kids and adults that not all police officers are bad. Some police officers make mistakes." 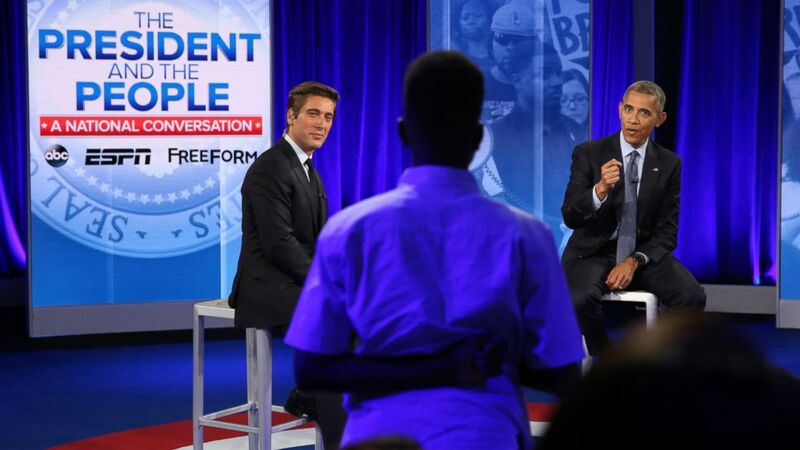 ABC’s David Muir moderates a town hall discussion with President Barack Obama and Americans affected by recent events, in Washington, D.C., July 14, 2016. 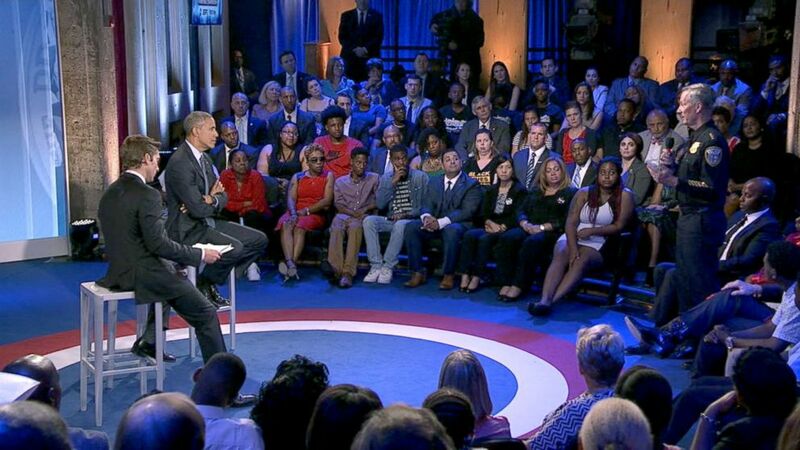 During the discussion, Obama faced some tough questions, including from Republican Texas Lt. Gov. Dan Patrick, who pushed the president on whether he had done enough to support of police officers. Teri George, the mother of a Baltimore police officer who was severely injured during the Freddie Gray protests last year, also asked the president how police are expected to protect themselves in those violent situations. Obama stressed that communities need to feel as if police officers are treating all individuals exactly the same. "I rely on law enforcement to protect me and my family, just like everybody else does," Obama said. "So often we wait until something bad happens and we react. And then everybody’s emotions are high and everybody is angry and hurt and what we want to do is have these conversations before something bad happens. We’ve seen departments do that well... and that’s why I say good policing is compatible with fair policing and safe policing. "If you implement best practices, police officers are safer, the community is safer," he added. The president said that it's not just police, but activists, too, who need to make efforts to reach out to local officials in order to enact change. He told 19-year-old Clifton Kinnie, a "Black Lives Matter" activist from Ferguson, Missouri, that "the goal of protest isn’t just to protest for the sake of protesting." Obama also addressed recent comments from critics of the "Black Live Matter" movement, who have said that its not supporting "all lives." "We shouldn’t get too caught up in this notion that somehow people who are asking for fair treatment are somehow automatically anti-police, are trying to only look out for black lives as opposed to others," Obama said. "The phrase 'Black Lives Matter' simply refers to the notion that there’s a specific vulnerability for African Americans that needs to be addressed. It’s not meant to suggest that other lives don’t matter. It’s to suggest that other folks aren’t experiencing this particular vulnerability." "This isn’t a matter of us versus them, but it’s a matter of all of us, together as Americans working to solve this problem, then I think we will solve it," he continued. "It’s going to take a while to get to the point where we want to be. But nobody’s more hopeful than me."